Sean Dixon-Bodie of Bloomfield was the one guy to leap further than 22 feet, and he took home the gold. Jahiem Spruill of Norwich FA was two inches behind at 21-11.5. The rest of the field all went past 21 as Hillhouse's Neal Eley was 3rd, Anthony Simpson of Bloomfield was 4th at 21-3.5, Ajrael Anderson of Bloomfield was a half-inch further back in 5th, and Messiah Harling of Wilby was another half-inch back in 6th. Chet Ellis of Staples finished just an inch off the meet record with a 6-9.25 jump, and Derby's Ja'kwan Hale picked up his second silver medal to go with his 300m one by scaling 6-4. Shaun Graham of Amity and Peter Fuller of Canton both cleared 6-2 for 3rd and 4th. Jahiem Spruill of Norwich FA in 5th and Russell Powell of Hand and Chaddane Williams of Bloomfield with a share of 6th all jumped 6-0. Four guys had cleared 14 feet on the season coming in, but Class S champ Hayden Rovelli of Coginchaug was the one to do it in the CIAC meet to walk off with the gold. Matthew Bigelow of Weston was 2nd at 13-6. Four guys who cleared 13-0 with no misses at lower heights shared 3rd place and 3.25 points each, including Nicholas Costantini of Foran, Jacob Bazinet of Norwich FA, Joseph Hinckley of Stonington, and Aidan O'Connor of Lewis Mills . 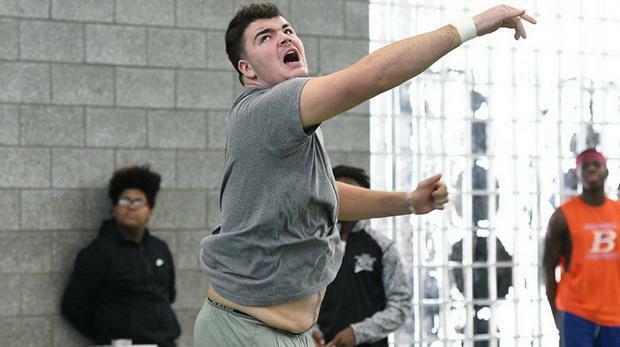 RHAM's Michael Browning repeated as champion, but this year his winning throw was more than 6 feet further than his 2018 mark, and last Saturday it was a season's best throw of 59-4.5 on his final attempt of the competition. The rest of the scoring places were all over 53 feet, as Natanael Barbosa of Windham was 2nd at a last throw 56.10.25, Jack Conley of New Caanan was 3rd at 54-11.5, Nathan Quaye of Manchester was 4th at 53-11.75, Cameron Belton of Norwich Free Academy got 5th a quarter inch back at 53-11.5, and Aaron Williams of Bloomfield was 6th at 53-3.